Image: Delta Safari undergoing TVEC for the treatment of atrial fibrillation. Poor performance in horses can be caused by a condition called atrial fibrillation in which the heart beats abnormally and blood cannot be pumped around the horse’s body efficiently. TVEC, an alternative to the more common treatment, quinidine, can be used to treat atrial fibrillation. 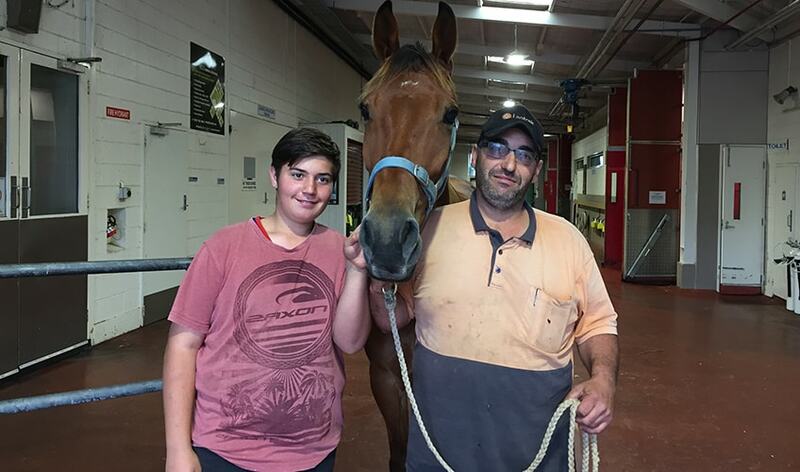 Matthew and Amanda Falzon and their son Nathan brought their horse, Delta Safari, to U-Vet Werribee Equine Centre in late November because of poor performance. Delta Safari had been in atrial fibrillation before, and they thought it might have happened again. Atrial fibrillation was suspected upon listening to Delta Safari’s heart, and the diagnosis was confirmed with an electrocardiogram (ECG). It was decided TVEC would be the best treatment option based on the horse’s previous treatment with quinidine. Atrial fibrillation is the most common cardiac arrhythmia (abnormal heart rhythm) in horses. It is caused by abnormal electrical activity in the atria (upper chambers of the heart). This loss of normal, organised contraction of the atria causes poor performance, especially at high intensity exercise, as the horse cannot pump enough blood from the atria into the ventricles, and then around the body and to the lungs. Atrial fibrillation is most commonly treated with quinidine sulfate, which makes heart muscle cells less excitable and allows the normal conduction system to take over again. Provided the heart is structurally normal, treatment with quinidine is usually successful. For some horses however, quinidine might not be suitable because they either develop toxic side effects, or don’t respond to treatment. Transvenous electrocardioversion (TVEC) is an alternative treatment for atrial fibrillation. It involves the delivery of electricity to the atria under general anaesthesia through two electrode catheters inserted through the jugular vein into the left pulmonary artery and the right atrium. A shock is delivered from a defibrillator with the aim to stop the abnormal electrical activity in the atria, and allow normal conduction to take back over. Shocks can be repeated if necessary, increasing energy delivery each time. Once a normal rhythm is restored, the horse is recovered from anaesthesia. U-Vet Werribee Equine Centre now offers TVEC for select cases of atrial fibrillation, as an alternative to treatment with quinidine. While TVEC has been performed widely in specialist equine hospitals in Europe and North America since it was first described in 2005, the treatment has not yet been widely performed in Australia. The reported success rate of TVEC is similar to that of quinidine, however, the benefit of TVEC is that it provides an alternative treatment for horses that develop toxic side effects to quinidine, or where previous treatment with quinidine has been unsuccessful. Image: Leaving hospital: Matthew Falzon and his son Nathan with Delta Safari – the first horse to be treated for atrial fibrillation using TVEC at U-Vet Werribee Equine Centre.